A cid rain is not a recent phenomenon. The term was first coined in 1852 by a chemist, Robert Angus Smith. The 35-year-old chemist, while studying the quality of air in and around his home town Manchester, England, found local rainfall to be unusually acidic. He suspected a connection between this occurrence and sulphur dioxide emissions when coal was burnt by local factories. He even noticed that the acid in the air was causing textiles to lose their colours and metals to corrode. The air over Manchester was partly cleaned by building tall chimneys at power stations and factories which release pollutants high into the air. These chimneys improved the air quality locally by dispersing the pollutants, but they were only blown across into neighbouring countries. The uk 's early awareness of pollution was related to its early industrialisation. But even in less industrialised parts of Europe, observers were beginning to worry about the effects of smoke from coal. In 1881, Norwegian scientists observed polluted snowfall and attributed it to a large town or industrial district in England. Just before World War I, mass deaths began to occur among fish in the rivers of southern Norway. Lakes, too, began losing their fish populations. But it was only in the 1950s that the link with acid rain was established. In his book Acid Earth , John McCormick recounts that research in Austria and England from 1911-1919 showed that rain with dilute sulphuric acid inhibited plant growth. In 1924, a farmer from Manchester even sued the power station at Barton in England for compensation, arguing that sulphur emissions were damaging his crops. His claim, however, was rejected by the House of Lords. Today, industrial regions suffer much more acidic fall-out than they did before the Industrial Revolution. In 1968, scientists had pointed out that rainwater was becoming increasingly acidic with each passing year. Acid rain has continued to spread and today covers nearly the whole of Europe, Canada, usa and the Scandinavian countries. By 1982, there were 18,000 acidified lakes in Sweden (twice as many as in 1975). The lakes in the region were previously known for their diversity of flora and fauna. Acid-sensitive species disappeared from roughly 120,000 square kilometres (sq km) or about 40 per cent of the country's lakes. According to John McCormick, studies conducted between 1985 and 1990 in southern Norway, revealed that fish populations had been lost in 2,650 lakes over an area of 33,000 sq km. Salmon had disappeared from most of southern Norway's rivers and brown trout populations had declined. Many lakes and streams in the us and Canada are extremely acidified because they rest atop soil with a limited capacity to neutralise compounds (called buffering capacity). The us National Surface Water Survey found that acid rain had affected 75 per cent of the lakes and about half the streams. In north America, electricity generation accounts for about 70 per cent of annual so 2 and 30 per cent no x emissions. In Canada, over 40,000 lakes have been permanently polluted by acid rain. Scientists from Norway and Sweden claim that acid rain, mainly brought by the winds blowing from heavily industrialised Europe, has caused at least 15 per cent reduction in timber growth. Increased acidity affects marine life, which, in turn, effects humans and animals living off marine life. Acidity in water affects the egg-producing ability of fish and decomposition of organic matter slows down. Human beings who live by eating fish from these lakes are also affected (see box: The toll rises ). Acid rain has been the bone of contention between many Western countries because winds carry the pollutants across international boundaries. Sulphur and nitrogen compounds emitted by burning fossil fuels can be blown thousands of kilometres to cause acid rain in countries far from the points of origin. A report prepared by the us Environment Protection Agency ( epa ) says the large-scale weather systems often transport airborne acid pollutants thousands of kilometres from their source before they descend as rain. Thus, pollutants emitted from sources in the industrial heartland of the midwestern states of the us and central Canada regularly fall on the comparatively less polluted areas of northeastern us and southeastern Canada, it says. "It is hard to predict where it can occur," says Nyati. It has been the cause of a long-standing disagreement between the us and Canada, and the Scandinavian and western and central European countries. While Canada sends half-a-million tonnes of dangerous emissions to usa , it receives almost two million tonnes in return. Norway and Sweden claim that they are being bombed by the uk and what was formerly West Germany. Similar charges have been made by France and Germany against each other. In January 1983, the us department of justice announced that two Canadian-produced films about acid rain, along with another film on nuclear war, were political propaganda, and may no longer be shown to us audiences without a disclaimer noting that the films were not endorsed or approved by the us government. 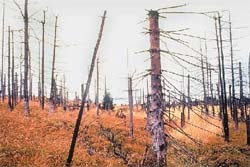 Canadians were worried that acid rain was a direct threat to their primary industries -- forestry, freshwater fisheries and tourism. Acid rain soured relations between the two countries for a number of years. According to the New York Times , when people in the us , think of the ravages of acid rain, they tend to think mainly of dead and dying watersheds in the northeastern part of the country, particularly those in New York's Adirondack Mountains where hundreds of highly acidified lakes and streams can no longer sustain aquatic life. But, this year, an exhaustive federal study has concluded that acid rain spread its poisons far and wide, damaging sensitive watersheds in the Southeastern region and in ecologically significant areas of western usa like the Sierra Nevada, the Cascade Range and some parts of the Rocky Mountains. These findings submitted by a federal panel -- the National Acidic Precipitation Assessment Program -- are disturbing. But they could also recruit new allies to the unfinished struggle against acid rain. In 1990, the us Congress confronted the problem for the first time, ordering coal-fired utilities and other industries to halve their emissions of sulphur dioxide, the main cause of acid rain, over the next decade. Nitrogen was also regulated by the 1990 law because it causes smog, a serious health hazard. But not until the mid-l990s was nitrogen recognised as a significant contributor to acid rain as well. The federal panel report shows that emissions of sulphur dioxide have declined sharply and at relatively low costs, due mainly to the 1990 law. The report also suggests that the law and subsequent regulations aimed at reducing oxides of nitrogen from power plants should have a positive effect, though the evidence so far is sketchy. But the problem is far from solved, and in some areas may be much worse than anyone thought. If present trends continue, the report warns, about half the Adirondack's 2,800 lakes and streams will be too acidic to support life by the year 2040. The San Gabriel Mountains near Los Angeles are 'saturated' with nitrogen meaning that excess nitrogen is seeping into nearby lakes and streams. Watersheds in other western ecosystems are similarly afflicted.